1980. Fine. WELTY, Eudora. THE COLLECTED STORIES OF EUDORA WELTY. New York: Harcourt Brace Jovanovich (1980). First trade edition (a limited edition, privatey printed, precedes this one). 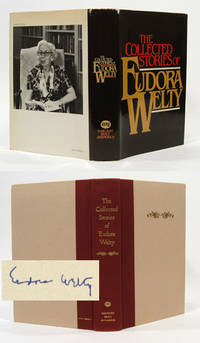 Inscribed by Welty on half-title, dated 1983. xvi + 622 pp. 8vo., quarter dark red cloth with tan paper covered boards, both stamped in gilt. Near fine, the only flaw to the book being some slight fading to the cloth at the heel of the spine, and very slightly bumped top corners. Owner's gift inscription to front flyleaf. In near fine dust jacket with minimal wear at corners.